Those of you who follow this blog know that I like to fish. So when I read that there was a fishing theme to this play I was predisposed to like it before I even sat down. I also like Hugh Jackman, whose larger than life presence and quiet demeanor hook you right into this intimate play, made even more so at the Circle in the Square Theater. There’s a Man, two Women and a fish.The man has a cabin on a river that is a special place for him. It’s where as a young boy he caught his very first fish, only to lose it. The rush of excitement of catching this fish is a feeling that he tries to explain to the women he brings to the cabin. But now the cabin has become something more. It’s a place where the man brings girlfriends trying to recapture the rush he felt from his first love, before that too was lost. I only hoped they filmed it so that at some point those of us who bought and read the play because we couldn’t get to Broadway might just have a chance to see it at some point on PBS. Broadway needs to learn to be fair to those of us who love theater but almost never get a chance to see the great performances. 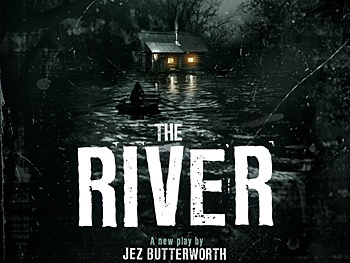 I haven’t read that they are planning on filming The River, but it is not unheard of. The Twelfth Night with Mark Rylance and Of Mice and Men with James Franco and Chris O’Dowd was taped when they were on Broadway. So it seems you are not alone in wanting to be able to see productions even though you can’t get to the theater. It really is a win/win. The producers would benefit as would the public. The Nance was just on PBS with their series of Broadway shows. In the past there has been Carousel, Into The Woods and Company, but very few straight plays. It’s definitely time to spread the word that live theater is important. I don’t know of anyone who loves theater who would pass on live shows when it comes to their part of the geography, but they deserve to see the Broadway casts to encourage attendance rather than scrounging around for knockoff bad production DVDs.